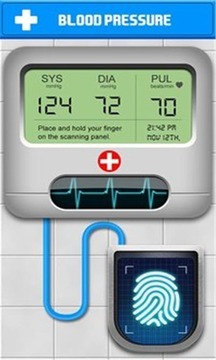 Finger Blood Pressure Checker is a simulated blood pressure app which measures your blood pressure and pulse heart rate. You can use it to prank you friends that you can scan your fingerprint to take the blood pressure and heart rate using your phone. Our Blood Pressure and Heart Rate Monitor has realistic UI Graphics and excellent sounds. When you press your finger on the fingerprint scanner, the scanner bar will scan, the display will show the dynamic heart beat diagram. After the scanning, your blood pressure result will show as three professional data, they are SYS, DIA and Pulse. 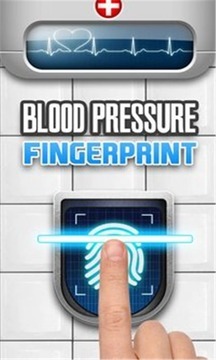 Disclaimer: Finger Blood Pressure is a simulated app for entertainment purposes. In fact it cannot measure your blood pressure or heart rate. It is for you to fool your friends or for kids to play doctor games.